The Therapy Outcome Measure (TOM) allows professionals from many disciplines working in health, social care and education to describe the relative abilities and difficulties of a patient/client in the four domains of impairment, activity, participation and wellbeing in order to monitor changes over time. TOM has been rigorously tested for reliability and clinical validity. It is quick and simple to use, taking just a few minutes to complete, and is used for treatment planning, clinical management, audit and research. It allows for the aggregation of data so that comparisons can be made for the purposes of internal and external benchmarking. The welcomed third edition of this book guides the reader through the use of the TOM tool for measuring outcome data. 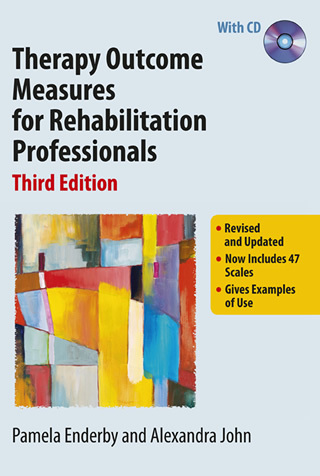 The book introduces the reader to its core scale of measurement and the 47 additional adapted scales for use within a variety of clinical specialisms. The book clearly describes what an outcome measure is and how TOM can measure clinical changes that can be useful for patients, clinicians and stakeholders. It gives a clear and concise overview of the theoretical framework in which this tool is grounded and provides practical advice for implementing the tool. The book provides a completed example of the tool as well as a resource CD, which contains all the tools you will need to complete a TOMS outcome measure. In the current climate of the RCSLT using TOM as its chosen tool to eneral a national dataset for the purpose of benchmarking and measuring the impact of our profession, this easy-to-read book is a must have for any department. All 47 scales for the different conditions are provided as separate downloadable pdf files on the accompanying CD along with other related material.